Winter burning is a common way to remove woody debris in our Forest Area. Please remember snow and cold temperatures will not put out a fire. In fact, a fire that is not properly extinguished can move smolder until spring, when it can reignite as a wildfire. Now is the right time to go back and check all winter burn sites to make sure they are completely out. From October 31 - February 28, a fire permit is no longer needed to burn within the Forest Protection Area of Alberta. Please remember that if you ignite a fire, you are still responsible if it causes a wildfire. Below are some tips on how to prevent a wildfire while burning outside of the wildfire season. Choose a location that is on high ground and so that pile can be 25 metres or more away from structures and standing trees. Learn more about properly preparing a burn site here. Surround the pile with a fireguard that is at least 15 metres wide - preferably bare mineral soil. Ensure the pile is clean of dirt so it can burn cleanly and quickly. Prior to burning, notify the Whiteocurt Forest Area of your burn site. Have ready your start and end dates of burn, description of materials to be burnt and the legal land description. Have someone on site monitoring the burn the entire time - if it escapes, immediately report it to the local Whitecourt Forest Area Office: 780-778-7272. Have adequate tools, water and equipment on site when burning. If you require advice on this, call the Whitecourt Forest Area Office. Only burn what you can control with the equipment, people and weather conditions you have available. Spread out the remaining material within the pile. Soak the area and ensure both heat and smoke are no longer being produced by the pile - it should be cool to the touch. Check your burn site multiple times in the coming weeks to ensure it has not reignited. Firefighters are preparing for the next wildfire season, and are on duty to respond to any wildfires that happen over the winter months. As spring arrives and the snow starts to melt, it is a great time to make your property FireSmart. Did you know there are grants available to help you and your neighborhood become FireSmart? 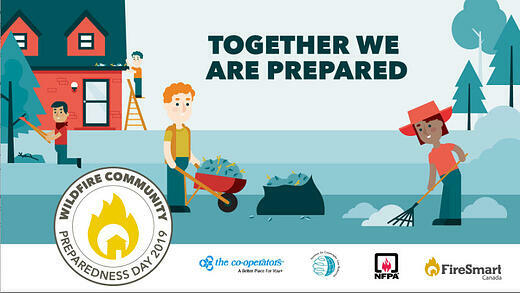 Applications are now being accepted for the Wildfire Community Preparedness Day. Awards can be up to $500, learn more. Your application deadline is March 9, 2019. You can visit FireSmart Canada on Facebook and Twitter. Unless conditions change, your next wildfire update will be on Feb. 21, 2019.